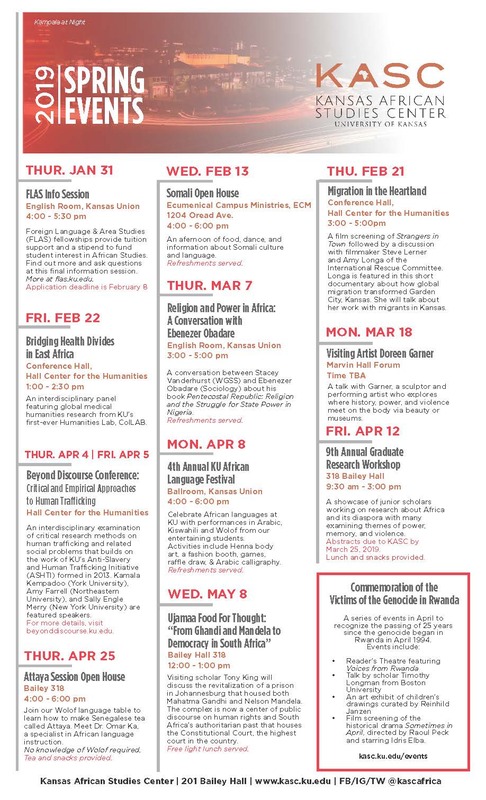 LAWRENCE — While academic awareness of African peoples’ hunting with poison-tipped arrows extends back for centuries, knowledge of the ingenious practice has been scattered among chemistry, entomology and anthropology texts. 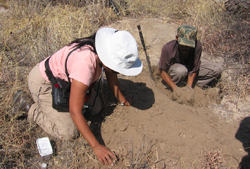 Chaboo and her co-authors — Megan Biesele of the Kalahari Peoples Fund, Robert K. Hitchcock of the University of New Mexico and Andrea Weeks of George Mason University — synthesized historical and anthropological literature and conducted their own fieldwork to better grasp how the San use beetle arrow poisons. The investigation reports poison use for nine San nations in Botswana and Namibia: G| ui, G||ana, G|| olo, Hai||on, Ju’|hoansi, Kua, Naro, Tsila and Xao-ǁ’aen. Indeed, this slow chase by the hunter is the basis for the San’s famous tracking culture. 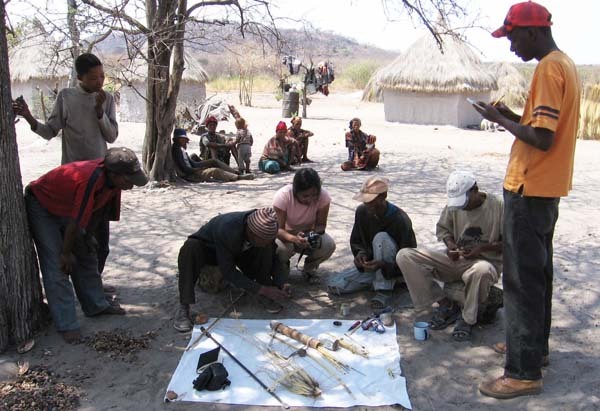 Chaboo’s work in Namibia was supported by the American Museum of Natural History and would also not have been possible with in-country collaboration with San communities and the National Museum of Namibia. Photos, from top: KU Professor Caroline Chaboo (pink shirt) sets up a photo-shoot with Hai| | om hunters in the Nyae Nyae Conservancy, Kalahari, Namibia. 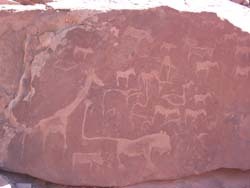 Top left: Rock paintings in Namibia depict animals that no longer live in the area. 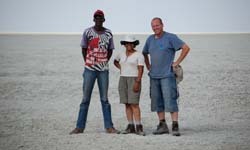 Middle: Michael Kazondunge, Caroline Chaboo, Holger Vollbrecht are pictured on the Great Etosha Salt Pan, Etosha National Park, Namibia. Bottom: Chaboo sifts out beetles from sand dug up by San hunter (right), Nyae Nyae Conservancy, Kalahari, Namibia.